The Rogue Fitness has always been named alongside quality, because they are made and assembled in America, but the name has not been budget friendly most of the time. Purchasing a product from California isn’t a piece of cake, especially for locals, but it still lets you to save your shipping cost. However, Rogue follows a policy to discount the rates of their barbell during Christmas, Black Friday and CF Games only, still people spend their most for Rogue Barbell because they know they are getting a quality product in their rightful investment. 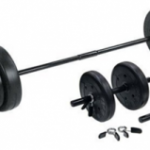 Rogue Fitness consist of a wide collection in branded barbells around the world. It can be disconcerting trying to choose which bar correctly fits your needs. You can go through many product pages, read reviews, and do comparison for hours, but you won’t be exactly satisfied till the time you’ll have a correct feel on the bar. That’s why Rogue do consistent rotation in its barbells, by adding some, removing some and in the end bringing a new version of the bar having same or mix features. Making every Rogue bar almost different from each other in any way. Hence, most of the differences are just related to design and are considered very minor in terms of gym equipment. The Rogue 28MM Training Bar is engineered in USA using the same steel shaft and consistent knurl pattern as Rogue Olympic weightlifting bar. 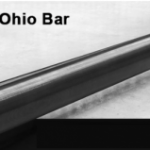 Exchanging with the Olympic bar’s bearing sleeves, the training bar is manufactured with bronze bushings just like style of Rogue Ohio Bar. Resulting them to become more affordable, median bar for athletes who thrive to get that feel and look of a natural Olympic barbell. 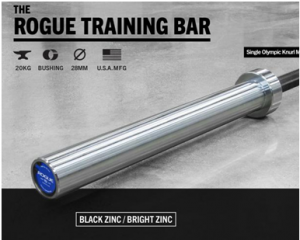 High quality US steel is used in the 28mmRogue training bar, which consist of a minimum tensile strength of 190K PSI. The testing of rod is done to check its straightness to within0.015” (0.38mm). The finishing of the bar is done with a Black Zinc shaft along with Bright Zinc sleeves. The Training bar gives a repetitive and less noisy smooth spin which gives a very comfortable feeling while working out. If you want to further test its spin, keep the rod on rack, loaded and unloaded, then check if the shafts are rotating freely or not within the sleeves. Though, in all cases the spin is comparatively impressive. Having a good, smooth spin doesn’t really mean that the bar tends to over spin after a time. The bar doesn’t reverses its spin direction after coming to a stop. Hence, the pendulum effect isn’t expected with a new bar, in fact the sleeves are settling correctly if it consist of a busted bearing, a bend in the shaft or an imbalanced bumper loaded. Well, if you are using Training bar for non-Olympic lifts then you can expect some unwanted rotations. Exactly the same thing with any high speed bearing bar. But the thing is not really knowing how well the bearings can hold for a time. Though, there isn’t mentioned anywhere in the description that it will spin for 10 to 20 years from now. Rather than having a superior aggressive knurl pattern like the most of the elite training bar(Eleiko, WerkSan, ZKC) in this barbell, Rogue toned up their knurl pattern a bit, and came up with something like tad milder and more refined. Hence, technically the training bar is more comfortable to hold down for a longer time. 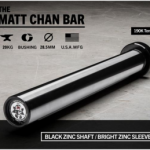 The traditional, aggressive knurl on training bars is not only comfortable and secure at higher weights, but it consist of some extra benefits of preparing you and your hands for the competition bars. Milder knurls like on Training bar offers a tight grip and makes you comfortable to hold for longer training sessions. The Rogue Training bar is very whippy, like above average in terms of elasticity. There is some kind of springiness on them which makes them feel like a genuine piece of equipment, and considering that you pay a genuine price for it, is a very good news. At heavy weights, the difference in whip between Eleiko and the Training bar is negligible. In lower, medium weight, you’ll find Elieko a bit more flexible. 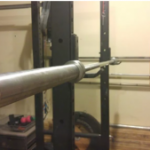 Still, elasticity can be felt in the Training bar on those weights in which many bars would remain rigid and stiff, thus making Training bar easily a high whip bar. The Training bar is having a bright zinc plating on sleeves and black zinc coating on rod, thus making it look immensely beautiful. Technically, there isn’t much to say here, as it’s certainly a work of an art. The use of the bar is for Olympic Weightlifting. The bar consist of Olympic knurling and have no center knurl. There is an Olympic knurl mark present on the bar. 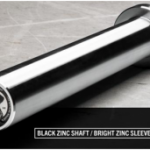 The shaft coating on the bar consist of Black Zinc. Overall, I think Rogue did a tremendous job with this 28mm Training bar. 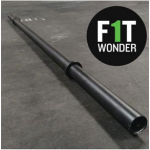 When it comes to me as I thought that Rogue is the leading CrossFit equipment provider and doesn’t really focuses on the actual sport of Olympic weightlifting, I am extremely happy to see that they manufactured a barbell that can do more than dabble. 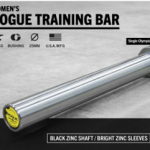 If you expect from Rogue that they only make basic bushing bars and some bumpers, then 28mm Training bar will be quite a lot surprising for you. When I was having a tough time choosing which bar to work with, then from that day I thought to set up a personal garage gym while taking a break from weightlifting. Though, I don’t like to get too technical with the bars. Certainly, I found 28mm training bar and I loved it. The whip was extremely good, the knurling was utmost pleasant. I’m short heighted, so I know the difference between dropping a 28mm diameter bar right away. This is a superb bar and it’s very easy to load and lift.I am usingmy Rogue 28mm bar for squats, snatches and cleans. I am enormously satisfied with the product’s smoothness,when you’ll use it, it is going to give you the exact same feel. The shipping by Rogue Fitness was very quick and it arrived in good packaging and extremely well condition. Hence, highly recommended stuff for everyone. Consist of extremely well done construction, with no signs of faulty manufacturing and weak tolerances. No noise is observed when dropped. The polished bright zinc sleeves makes them look flawless and beautiful. Consist of a nice spin with great whip, makes the working on this bar very comfortable. Comes with free shipping which eventually decrease your price. The bar is a bit of milder because of medium knurling. The bar is very expensive and compromises only for Olympic weightlifting use. Chance of chipping of Black zinc coating after a certain time.